Which 'Game Of Thrones' Character Is Your State's Champion In Trial By Combat? Given certain crazy events that happened in the season finale of "Game of Thrones," I think it's safe to say trial by combat will be returning in season seven of "Game of Thrones." You know, trial by combat, that one-on-one fight Cersei Lannister is happy to use in lieu of regular justice because she has The Mountain as her champion and basically wins any dispute. Well, with trial by combat in mind, the staff over at Tario & Associates, a law firm, surveyed over 10,000 fans of "Game of Thrones" across all 50 states, with about 200 people surveyed per state. The fans were asked which characters, alive or dead, they would choose to be their champions in trial by combat. The staff tallied the results and mapped them out below. I'm pretty mad at my home state, New York, for voting for The Mountain as its champion, whom I personally would note vote for. I won't say whom I would vote for, but I'll gladly show you a picture because he's just a great fighter and can basically kill anyone except Brienne of Tarth. But my opinion doesn't matter and, according to the survey, many people disagree with my pick. Although, I will point out, I'm not exactly alone on that. The Mountain, aka Ser Gregor Clegane, won the most states, and his brother Sandor Clegane, aka The Hound, was a close second. Khal Drogo took home six states and Jaime Lannister took home four. Scrappy Bronn took home two states and badass Brienne took just one state, Oregon. The survey granted that Jaime would have two hands, of course. 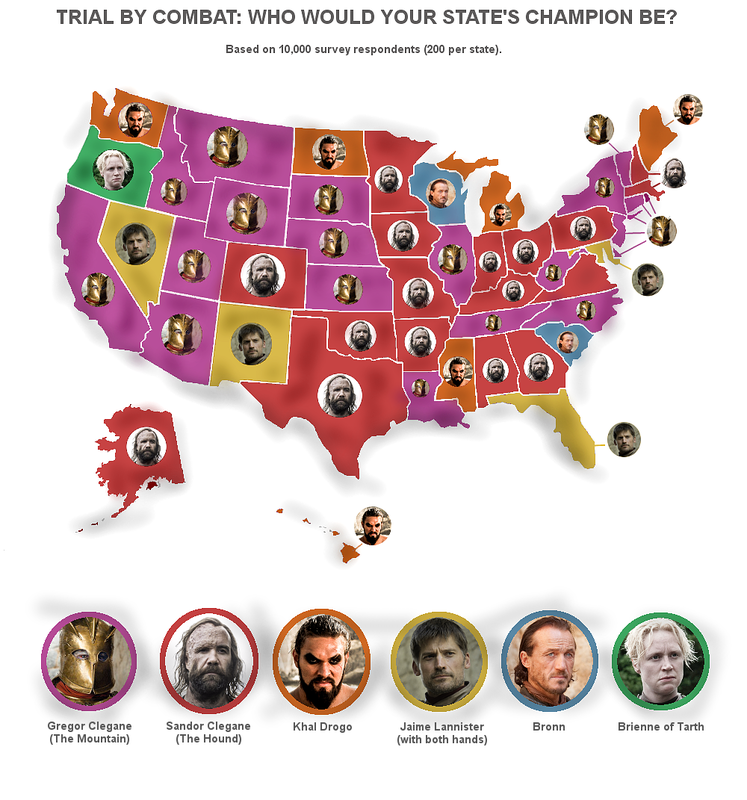 Check out the final tallies and states won by each "Game of Thrones" character below. Arizona, California, Connecticut, Delaware, Idaho, Illinois, Kansas, Louisiana, Montana, Nebraska, New Jersey, New York, North Carolina, Rhode Island, South Dakota, Tennessee, Utah, Vermont, West Virginia, Wyoming. Alabama, Alaska, Arkansas, Colorado, Georgia, Indiana, Iowa, Kentucky, Massachusetts, Minnesota, Missouri, New Hampshire, Ohio, Pennsylvania, Texas Oklahoma, Virginia. Hawaii, Maine, Michigan, Mississippi, North Dakota, Washington. Florida, Maryland, Nevada, New Mexico. Respect to Oregon for going with Brienne, but no state went for the Red Viper? That's crazy; Oberyn Martell practically killed The Mountain, and The Mountain was voted number one. Anyway, let us know in the poll below which "Game of Thrones" character would be your champion. If none of them would be your champion, let us know in the comments which other "GoT" character would be your champion.